Fue la primera iglesia importante construida por los indios en el lado poniente de la Plaza de Armas, bajo la dirección de los frailes Franciscanos que habitaban en el convento. 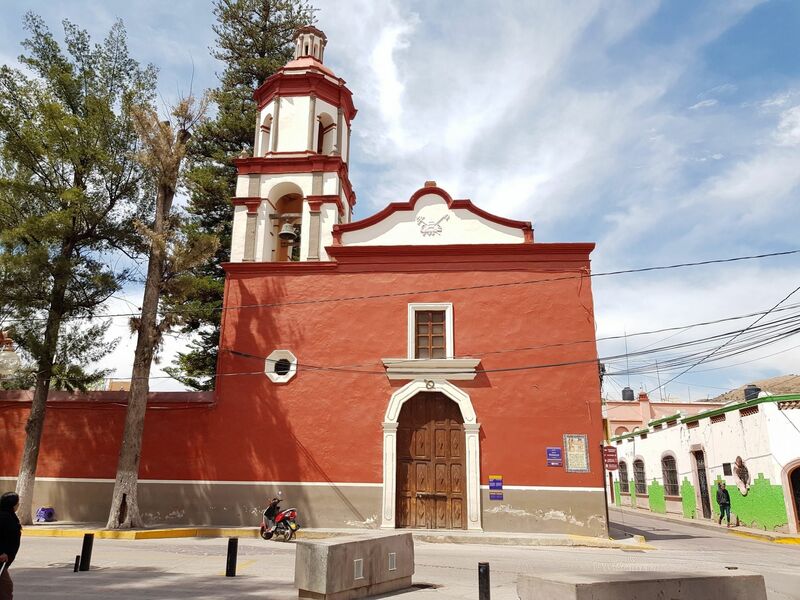 Posteriormente se le llamó Iglesia de Guadalupe, posiblemente debido a la formación del Patronato de la Virgen de Santa María de Guadalupe en el año de 1737. Para finales del siglo XVIII se le conocía como la Iglesia Vieja, y a mediados del siglo XIX se le dio el nombre que lleva hasta la actualidad. It was the first major church built by the Indians on the west side of the Plaza de Armas, under the direction of the Franciscan friars who lived in the convent. Later it was called Church of Guadalupe, possibly due to the formation of the Patronage of the Virgin of Santa María de Guadalupe in 1737. By the end of the 18th Century it was known as the Old Church, and in the mid-nineteenth century it was given the name it bears to this day. The marker is just to the right of the main entrance to the chapel. is in Santa María del Río, San Luis Potosí, in Municipality of Santa María del Río. Marker is at the intersection of Hidalgo and Calle Pascual M. Hernández Segura, on the right when traveling south on Hidalgo. Touch for map. Marker is in this post office area: Santa María del Río, San Luis Potosí 79650, Mexico. Touch for directions. Other nearby markers. At least 8 other markers are within walking distance of this marker. Otomíes and Guachichiles (here, next to this marker); Tourism Office (a few steps from this marker); The Parochial School of Music (a few steps from this marker); Primo Feliciano Velázquez Rodríguez (within shouting distance of this marker); City Hall (within shouting distance of this marker); Foundation of Santa María del Río (within shouting distance of this marker); Hidalgo Garden (within shouting distance of this marker); Dividing Line Between Otomíes and Guachichiles (about 90 meters away, measured in a direct line). Touch for a list and map of all markers in Santa María del Río. More. 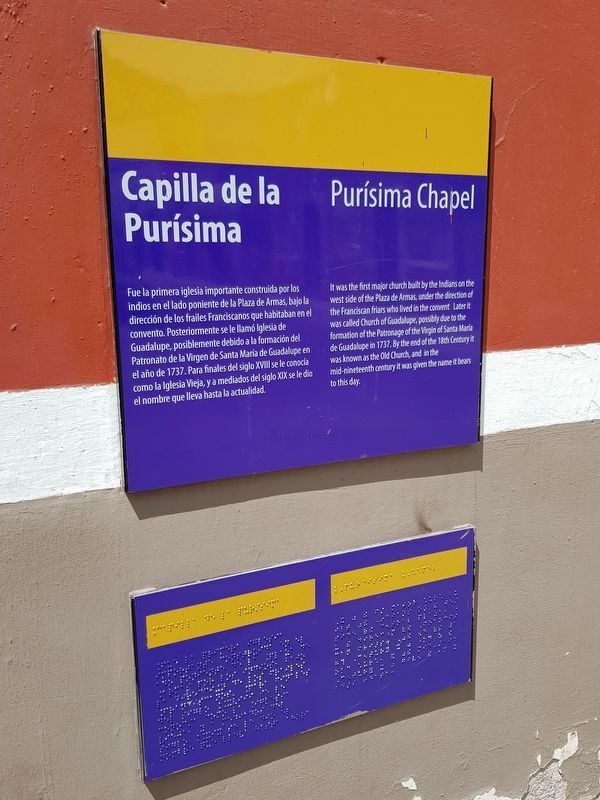 Search the internet for Purísima Chapel. Credits. This page was last revised on April 12, 2019. This page originally submitted on April 12, 2019, by J. Makali Bruton of Querétaro, Mexico. This page has been viewed 93 times since then. Photos: 1, 2. submitted on April 12, 2019, by J. Makali Bruton of Querétaro, Mexico.